Ion channels are macromolecular protein complexes which from pores across cell membranes to permit controlled movement of inorganic ions into and out of cells. The channel pores open and close in response to specific signals which link channel activity to various physiological functions including signal transmission between cells and metabolism. 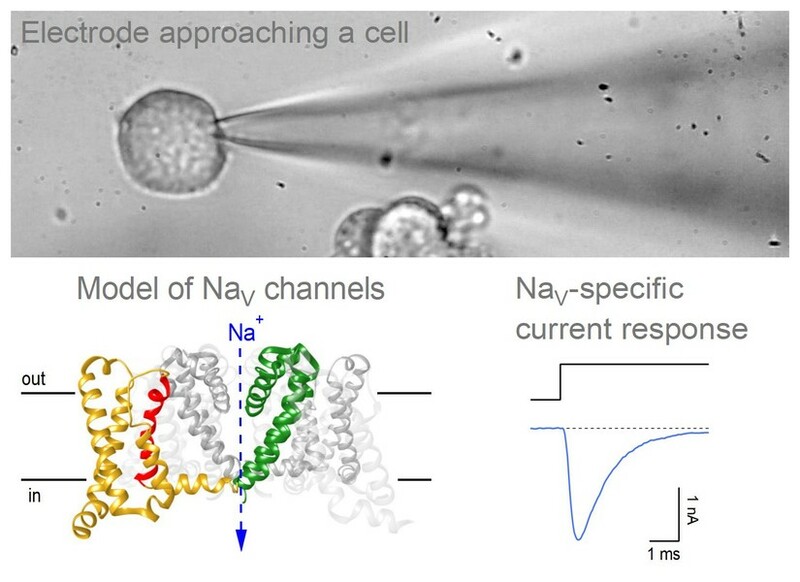 Voltage-gated sodium channels (NaV channels) are unique among the diverse family of ion channel proteins because they trigger action potentials - a basic feature of excitable cells and the basis for rapid electrical communication along and between neurons and myocytes. 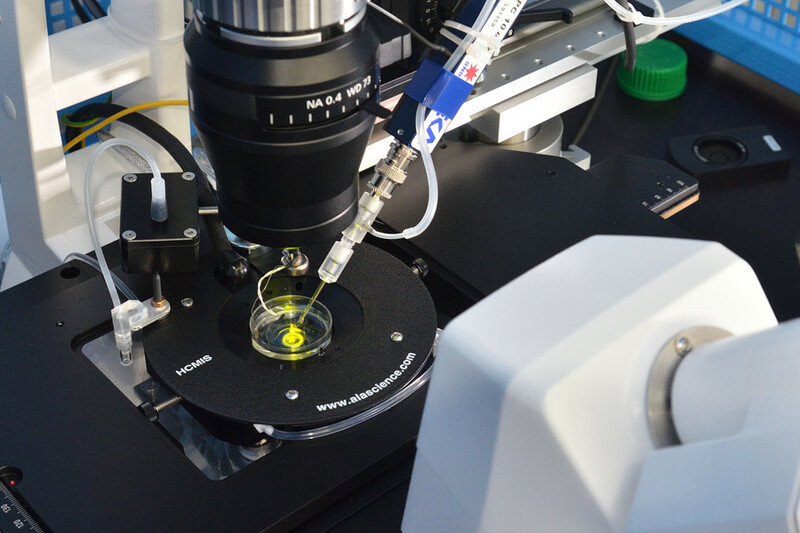 We use a combination of electrophysiological techniques (patch-clamp) and molecular biology methods to study the involvement of NaV channels in human diseases such as peripheral pain disorders and epilepsy. To better understand the disease mechanisms we investigate malfunctions of the channel proteins caused by mutations in the channel-encoding genes of affected patients and we analyze the impact of the mutations on the electrical properties of affected neurons. Furthermore, we study the interaction between the channel proteins and specific neurotoxins from venomous animals (e.g. marine cone snails, scorpions) because some neurotoxins are valuable tools for analyzing and understanding the basic principles of channel function. Martin C., Stoffler C., Mohammadi M., Hugo J., Leipold E., Oehler B., Rittner H., Blum R. (2018) NaV1.9 potentiates oxidized phospholipids-induced TRP responses only under inflammatory conditions. Front Mol Neurosci 11:7. King M.K., Leipold E., Goehringer J.M., Kurth I., Challman T.D. (2017) Pain insensitivity: Distal S6-segment mutations in NaV1.9 emerge as critical hotspot. Neurogenetics. DOI: 10.1007/s10048-017-0513-9. Leipold E., Ullrich F., Thiele M., Tietze A.A., Terlau H., Imhof D., Heinemann S.H., (2016) Subtype-specific block of voltage-gated K+ channels by µ-conopeptides. Biochem Biophys Res Commun. 482: 1135-1140. Leipold E., Hanson-Kahn A., Frick M., Gong P., Bernstein J.A., Voigt M., Katona I., Goral R.O., Altmüller J., Nürnberg P., Weis J., Hübner C.A., Heinemann S.H., Kurth I. (2015) Cold-aggravated pain in humans caused by a hyperactive NaV1.9 channel mutant. Nat Commun 6: 10049. Leipold E., Liebmann L., Korenke G.C., Heinrich T., Giesselmann S., Baets J., Ebbinghaus M., Goral R.O., Stödberg T., Hennings J.C., Bergmann M., Altmüller J., Thiele H., Wetzel A., Nürnberg P., Timmerman V., De Jonghe P., Blum R., Schaible H.G., Weis J., Heinemann S.H., Hübner C.A., Kurth I. (2013) A de novo gain-of-function mutation in SCN11A causes loss of pain perception. Nat Genet 45: 1399−1404. Close-up of an electrophysiology setup equipped to perform patch-clamp recordings. 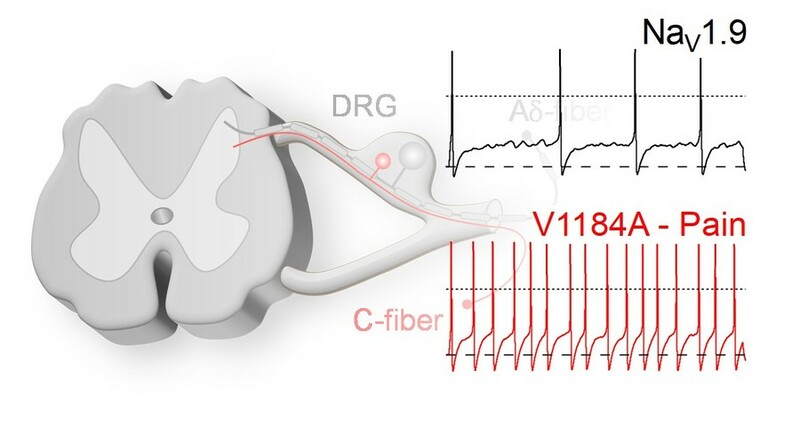 A mammalian cell overexpressing NaV channel proteins is in contact with an electrode to record channel-specific current responses. Mutations in the gene encoding the voltage-gated sodium channel NaV1.9 affect the electrical properties of nociceptive neurons ultimately causing severe pain phenotypes.